October 31, 2014. Samhaine – All Saints’ Eve – Halloween – take your pick. 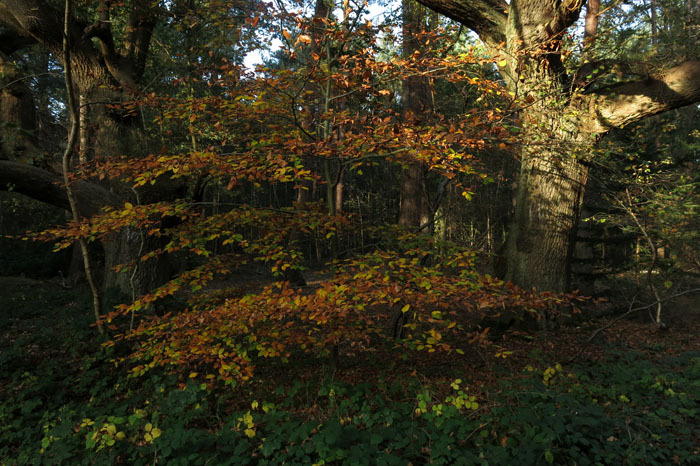 Old-school seasonality seems to be in retreat as autumn suddenly slips back a season in denial of shortening daylight hours and the termination of British Summer Time. This is the swan song of a flighty Indian summer that has had thermometers teetering at 20°C. Records will be broken – but that is nothing extraordinary in this unpredictable inter-glacial in which the inevitability of climate change obligingly reveals its hand to blinkered, consumption-addled humanity. Whatever the omens, the summery warmth feels benign– a good day for a walk along the Nar Valley Way between Castle Acre and Narborough. West of Castle Acre, pyramidal bonfires are piled high in west Norfolk fields awaiting Guy Fawkes Night on November 5th. Or maybe a day or three earlier, or later – national celebrations tend to be movable feasts these days. After an enjoyable tramp alongside fen and through autumn-blazed woodland I arrive in the small village of West Acre. 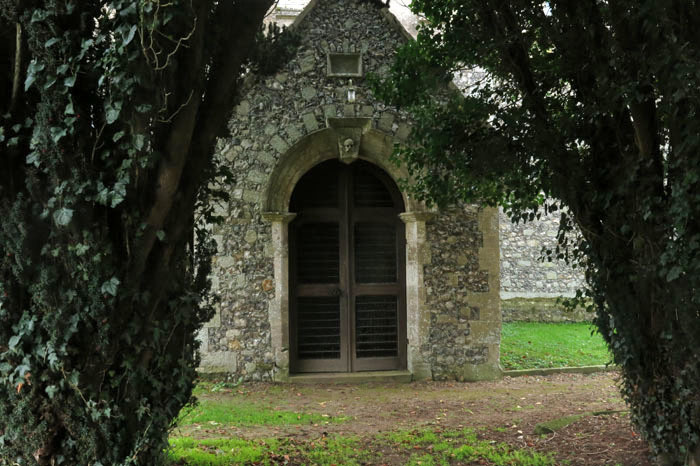 The village’s All Saints’ Church (an appropriate dedication given the date) is approached through a shaded corridor of dark yews, the skull above the door bidding a slightly macabre welcome. 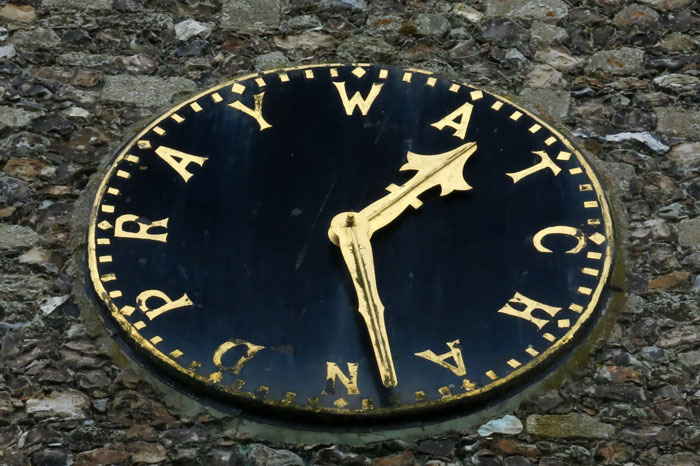 Above this, the tower clock face bears the legend: Watch and Pray. This is serious stuff, old time religion – no place for dilettante church visitors. The graveyard to the church’s south – a suntrap in which a climatically confused cherry tree is bursting into flower – seems altogether more friendly. 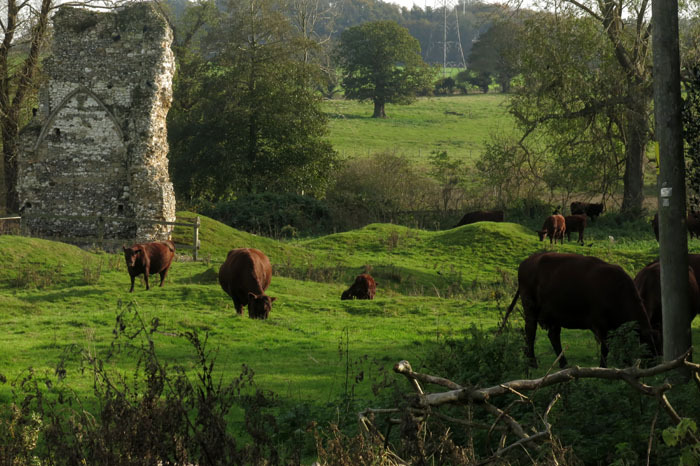 The ruins of a priory lie in the field next door guarded by brown bulls and a barbed wire fence. Just a gateway and a fragment of wall remain; the rest of the remains lie beneath turf, bulges like furniture draped beneath green baize. From West Acre the way leads alongside fields of sheep and through dense woodland before emerging at a clearing that has views of Narford Hall across a lake to the south. Narford Hall is the pile of the Fountaine family and the previous incumbent, Andrew Fountaine, who died in 1997, had quite a reputation for flirting with extremist politics. Disowned by the Conservatives for what were perceived as anti-Semitic views, he became a founding member of the National Front in 1967, standing for election on three occasions and organising “Aryan summer camps” on the grounds of his estate. His nephew, Tony Martin, the farmer who achieved nationwide notoriety for shooting and killing a 16-year old burglar at his home in the Fens back in 1999, was once a regular visitor. 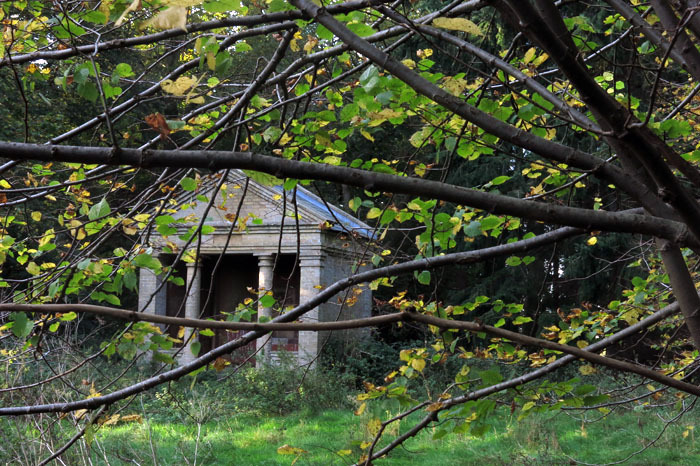 North of the clearing, tucked behind trees, is a curious neoclassical building, an obvious folly. I duck beneath pollarded lime boughs to investigate. It’s a simple affair, yet a grand gesture: a summer pavilion positioned to take in the view over the lake to the hall, a place from which to gleefully survey all of one’s domain. Behind the pillars, there a niche surrounded by attractive Art Nouveau tiles, some of which have been prised away from the wall. Broken tiles and crumbling bricks litter the floor. 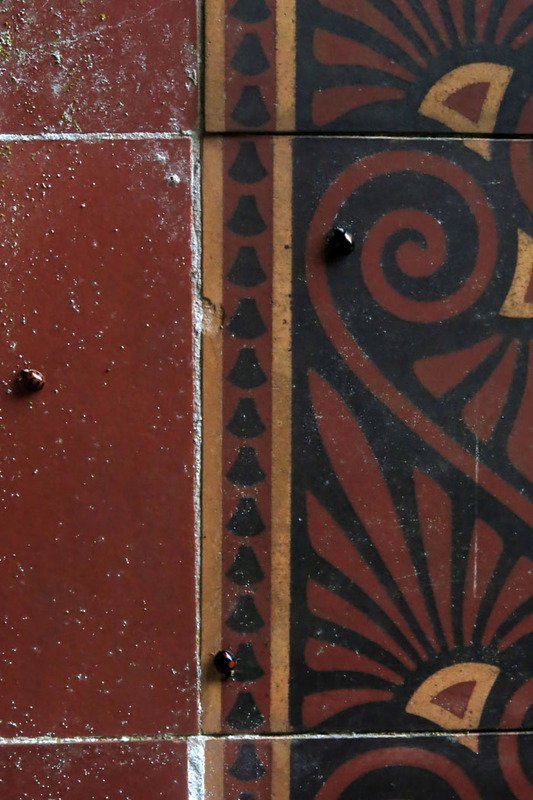 A closer inspection of the niche tiles reveals a number of ladybirds taking the sun, stirred from hibernation by the unexpected warmth. Folly indeed. This entry was posted in History, Norfolk, Walking and tagged churches, folly, medieval church, Nar Valley Way, Narford, West Acre. Bookmark the permalink. 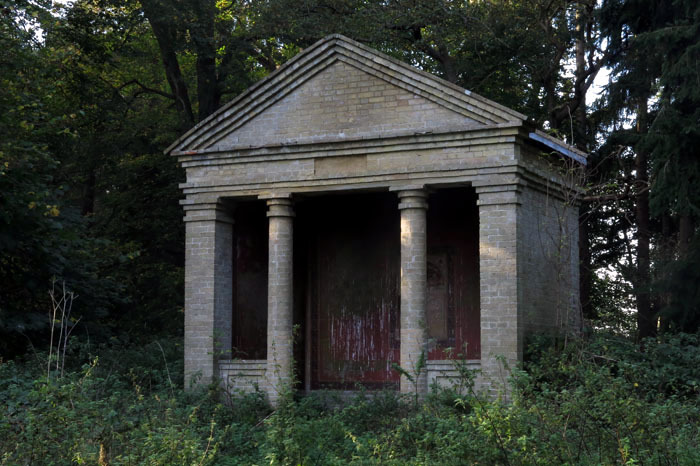 A lovely and very English country walk – right down to the dodgy landowner! Thank you, Alex. West Norfolk is both very English and still a bit feudal. I cannot help but wonder what an ‘Aryan summer camp’ is like, a sort of mini NF Glastonbury perhaps? This was a great walk with you, Laurence! On our way to Cambridge we stopped for a short visit at Castle Acre a couple of years ago, I’d love to see more of it and the surroundings. Thank you very much, Dina. 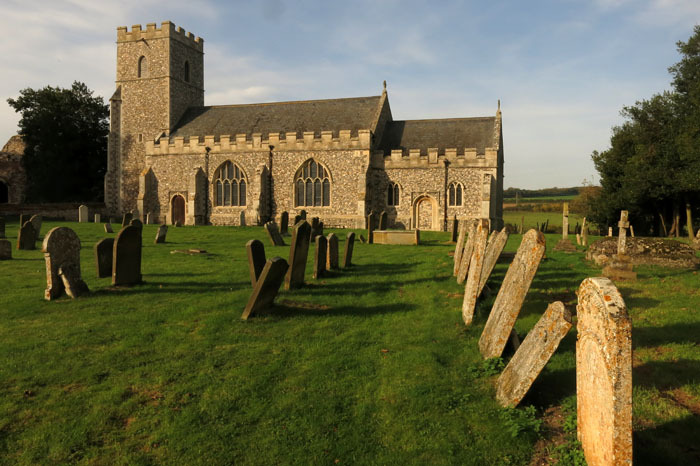 The Castle Acre area is actually a lovely part of Norfolk, one of my favourites – some great old churches there in the vicinity, even Saxon ones. I would definitely like to visit Cley again when the weather is better. A walk to Blakeney Point, a prolonged weekend in Spring, both sound great to me. Please wish Kb Happy Birthday from us both. It is Jackie’s birthday soon too and we are going to Heacham near Hunstanton to celebrate. All the best, Laurence.